The Valencia Region offers a wealth of opportunities for visitors to get in touch with nature and to admire numerous species of orchids, making this region a delightful destination for plant and wildlife lovers. Orchids that live in warm climates, such as the Mediterranean, are difficult to cultivate (unlike tropical species), since they produce minute seeds – a single plant can produce up to a million, almost microscopic seeds, which have no reserve tissues to support the embryo when it germinates. That is why they must be associated with fungi as soon as they germinate, which provides them with some of their nourishment, selectively. These are the so-called ‘mycorrhizae’, which are highly specific to each place and most likely to each species. Also, because they depend on fungi, these plants cannot live with harmful substances like sulphur and copper; which is why most orchids only grow in very natural places. 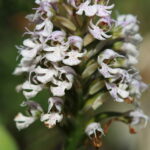 A total of 70 species of wild orchids have been identified in the Valencia Region, most of them classified as very rare. In addition, numerous uncommon hybrids such as Ophrys x castroviejoi, Ophrys x pielteri, Ophrys x pseudoespeculum, Orchis x bivonae and Ophrys x serrae can be found in the region. 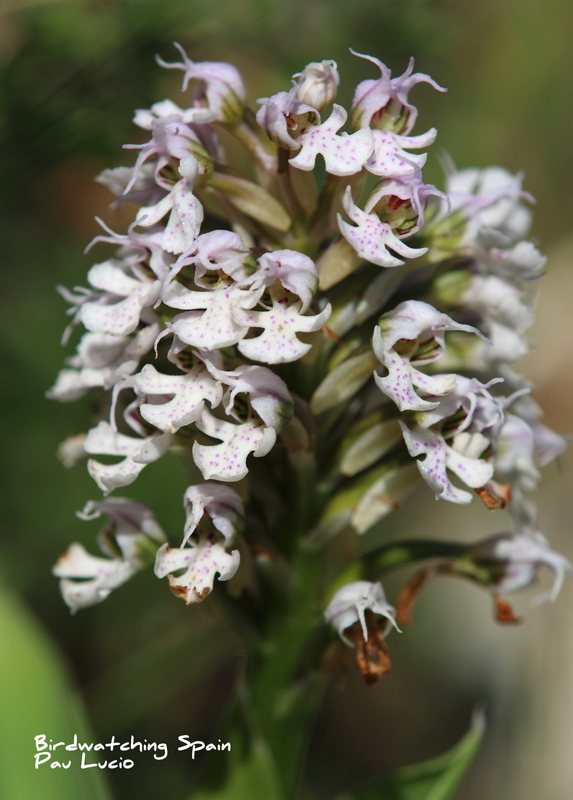 The diverse climate and soil in the Valencia Region means that there is also a very wide range of orchids, with some living in arid areas at low altitudes, such as the fan-lipped orchid (Orchis collina), and others found in the high, mountainous inland areas and north of Castellón, such as the Marsh Orchids (Dactylorhiza), Butterfly orchids (Platanthera), and the Frog orchid or long-bracted orchid (Coeloglossum), etc. One of these species, the dwarf rattlesnake plantain (Goodyera repens), is found mainly in the Pyrenees and the Pre-Pyrenees and in the inland areas of Castellón in Valencia Region, with several mountain ranges where it is absent between these colonies. 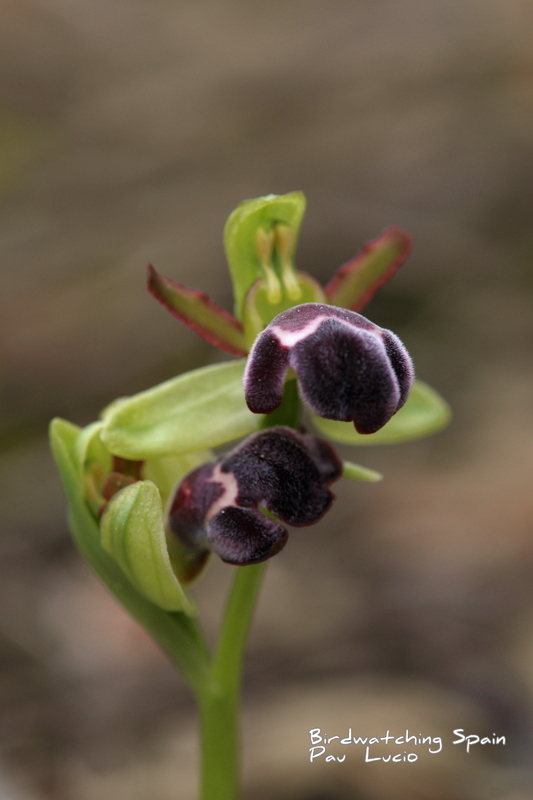 Many of our orchids, particularly those of the genus Ophrys – the most common type in Valencia’s lowlands – have flowers that look like wild bees, which is why they are known as bee orchids. Some of these orchids include the endemic Ophrys lucentina, a bee orchid with a distinctive yellow border in the “labellum”. In addition, we can find other beauties like the Sombre-bee Orchid (Ophrus lupercalis), Dark-bee orchid (Ophrys dyris), the Mirror orchid (Ophrys speculum) and the Yellow Bee orchid (Ophrys lutea) to name just a few. 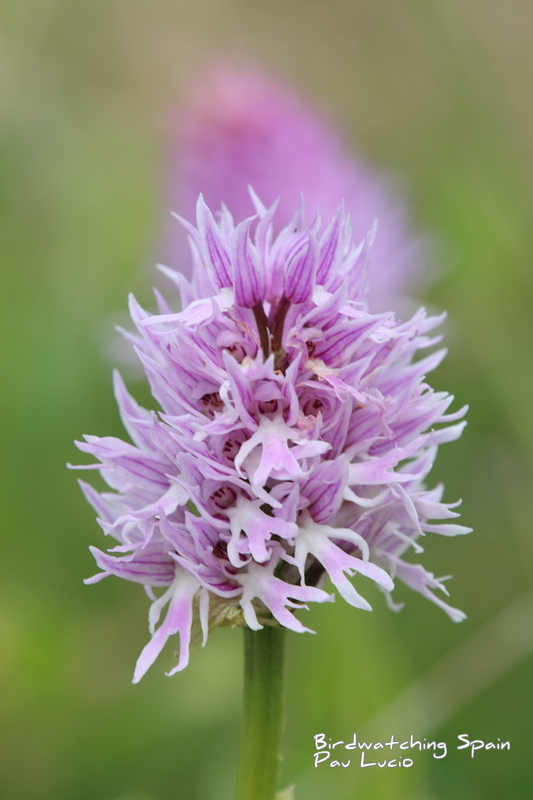 The genera Orchis is also well represented with gorgeous hybrids like Orchis x bivonae, a hybrid from the combination of Italian man orchid (Orchis italica) and Man orchid (Ochis anthropophora). Besides, it is not unusual to find large parched of Bug orchids (Orchis fragans) mixed with Pyramidal orchids (Anacamptis pyramidalis). We can overlook the largest of all, the impressive Giant orchid (Himantoglossum robertianum). A rather common specie and one of the earliest species to bloom. In Valencia region is also possible to find three species of Hellboline: Narrow-leaved Helleborine (Cephalanthera longifolia), White Helleborine (Cephalanthera damasonium) and red Helleborine (Cephalanthera rubra). They are found in the forested and highest mountains in the region. On the other hand, in the lowlands close the coast is possible to find two species of Serapias, the Tongue orchid (Serapia lingua) and the Small-flowered tongue orchid (Serapia parviflora). Finally, in Autumn we are delighted with the last orchid of the season, the Autumn lady’s tresses (Spiranthes spiralis). 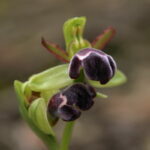 You can read more about the orchids found in the Valencia region and see some pictures in the following article. 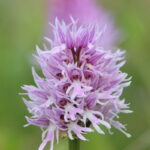 We as a local experts organise orchids walks that can be combined with butterflies and birds. Please, do not hesitate to contact us for further information.